Start off your visit on the 22nd (Mon): explore and take pictures at Lappi Areena. Get ready for a full day of sightseeing on the 23rd (Tue): stop by Your Piece Of Finland, don't miss a visit to Lordi's Square, take an in-depth tour of Arktikum, then take in the views from Lumberjack's Candle Bridge, and finally look for all kinds of wild species at Wildlife Areas. 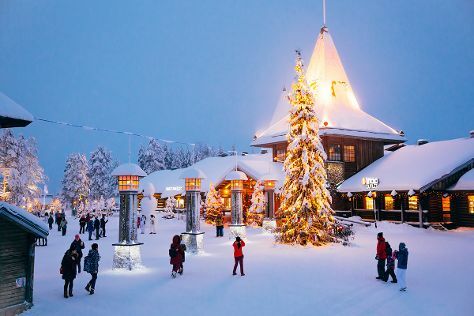 To find ratings, more things to do, reviews, and tourist information, read our Rovaniemi planning website . San Diego, USA to Rovaniemi is an approximately 20-hour flight. You can also do a combination of train and flight; or do a combination of flight, taxi, and bus. The time zone difference moving from Pacific Standard Time to Eastern European Time is 10 hours. Traveling from San Diego in April, expect Rovaniemi to be much colder, temps between 38°F and 26°F. Finish your sightseeing early on the 24th (Wed) so you can travel to Helsinki. Pack the 26th (Fri) with family-friendly diversions at Linnanmaki Amusement Park. There's much more to do: explore the galleries of Sea Fortress Suomenlinna, explore the world behind art at Kansallisgalleria, take in the spiritual surroundings of Uspenskin Cathedral (Uspenskin Katedraali), and appreciate the history behind Sibelius Monument. You can fly from Rovaniemi to Helsinki in 4 hours. Other options are to do a combination of train and flight; or drive. Plan for somewhat warmer temperatures traveling from Rovaniemi in April, with highs in Helsinki at 47°F and lows at 32°F. Finish your sightseeing early on the 28th (Sun) so you can travel back home.